I was painting this picture the other day and thought it might be fun to get my husband to take a quick video, I’ve not shown me painting this small before. You can watch me putting the finishing touches to this hummingbird painting which is just one inch in width. I use specialist tools and branded encaustic wax paint. 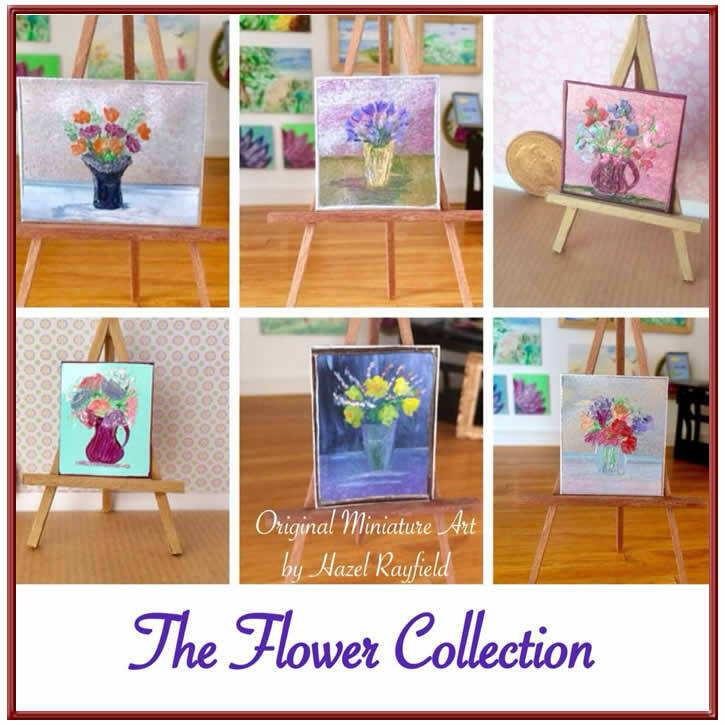 I have put together this little selection of my miniature dolls house flower paintings into this pretty collection. I love to paint flowers, all types, in garden settings as as still life as these are in their pots and vases. 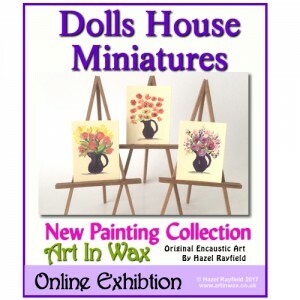 These miniature paintings work in many settings from period miniature dolls houses to themed miniature properties. All my miniature art is original. No copies. No prints. You are owning an original painting. Direct from the artist. I sell my work worldwide, you can buy direct from my website, or contact me direct, most of my sales come via the International store front I have at Etsy with paintings in 16 countries on 4 continents as far as I know……..
New Art In Wax Painting Exhibition Online today ! 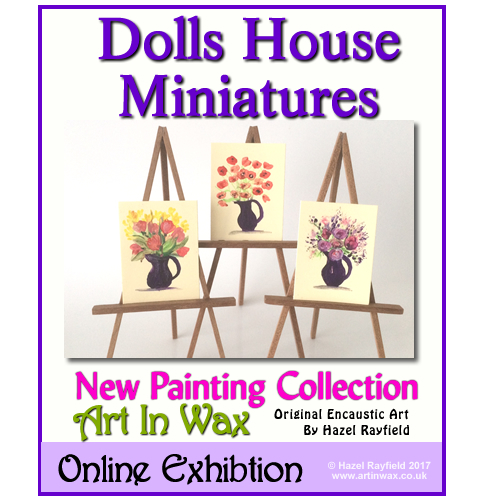 As a follower of my blog you may know that from time to time I paint a series of pictures within a theme that I feature on my Art In Wax website online exhibition page. This will be the first time I have done an exhibition page feature on my miniature dollhouse paintings, and not before time hey !! My miniature paintings have had an amazing response of the past few years and I sale more of these than any other size now and I have to admit they are my favorites and most challenging to paint …..
Miniature art is not just for Dolls Houses, they are also very popular as an art collectible. 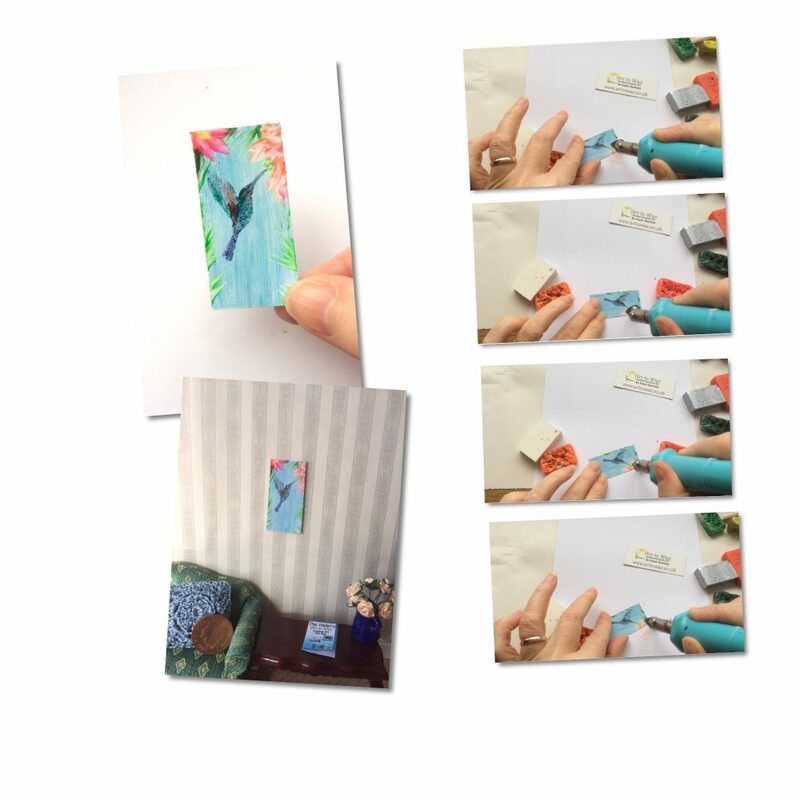 This collection for 2017, has six tiny pictures, each piece is just 2 x 1 1/2 inches and is painted in encaustic wax paints on specialist encaustic card which is a cream coloured gloss card. Daffodils, Tulips, Iris, Poppies, Roses all my favorite flowers ….. These paintings are not yet listed in my shop but are for sale contact me to buy direct from me the artist. To view the full collection of 6 paintings please ….. Which is your favourite ? Please leave me a comment below with your favourite. 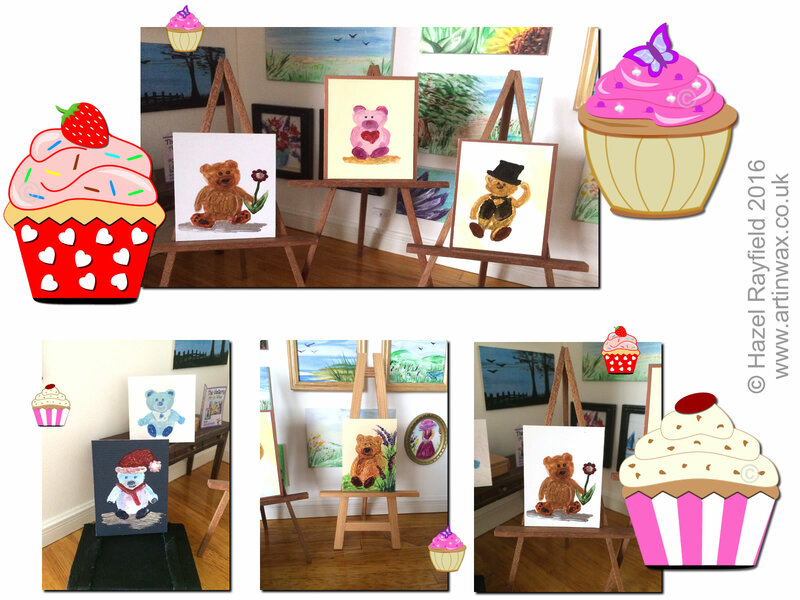 I love to do commissions (I only do commissions in my style – no copies or reproductions) and I was delighted this month to be commissioned to paint a Teddy Bear which will be residing in a Dolls House Nursery. The lady who commissioned me has been a collector of Art In Wax for a while now and wanted a new Teddy painting for her themed room, so I let my imagination have fun with the project and come up with this small collection of Teddy paintings …..
Baby Blue : 1 1/2 x 1 1/2 inches approx. Teddy Trio : On green card with a silver painted edge. 2 x 1 1/4 inches approx. Flower Teddy : 2 x 1 1/2 inches approx. Top Hat Teddy 2 x 1 1/2 inches in size. All painted in encaustic wax paints they have a lovely texture and sheen. These are miniature collectible pieces of art and are not suitable for children. Paintings For Sale : If you see any painting on my blog but it is not in my shop please contact me, not all paintings are listed on miniatures website shop, it may be in my etsy store or not online at all, please contact me to enquiry …..